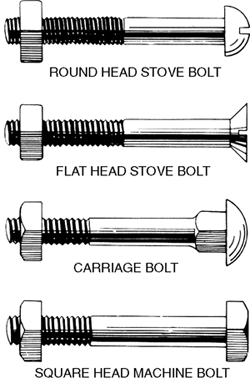 A rod or pin, with a permanent head on one end, that holds parts of a building or structure together. A rod, usually of metal, with a square, round, or hexagonal head at one end and a screw thread on the other, used to fasten objects together. A short section of tree trunk. In veneer production, a short log of a length suitable for peeling on a lathe. The sliding part in a breechloading weapon that pushes a cartridge into position and holds it there as the gun is fired. The entire length of cloth from a loom. 1. A metallic pin or rod having a head at one end and an external thread on the other for screwing up a nut; used for holding members or parts of members together. 2. A short section cut from a tree trunk. 3. A short log from which veneer is peeled.